The porcupine is a slow-moving rodent. It lives in the forest regions of Canada and the United States. Early settlers hunted porcupine for its meat. The only known enemy of porcupines is the fisher. A fisher is a weasel-type animal that hunts small animals in trees at night. The fisher flips the porcupine onto its back. Then, it attacks the unprotected chest and stomach of the porcupine. Many people consider the porcupine a pest because it kills trees. You will see why when you read about its food source. Porcupines are furry animals that grow to be 2 or 3 feet in length. Their tails can add up to a foot. Porcupines are well known for their loose, sharp hairs called quills. The porcupine’s quills cover all of its body except for its chest and stomach. The porcupine protects most of its body with about 30,000 quills. When danger is near, the quills stick out. An animal that attacks a porcupine can end up with a nose full of sharp, painful quills. Their legs are short and their bodies are rounded. They have padded feet and long sharp claws. Porcupines usually weigh between 8 to 15 pounds. However, some males have weighed as much as 40 pounds. The male porcupine lives alone. It looks for a mate in late fall. It does not see well so it has to use its sharp senses of hearing and smelling to find a mate. After mating, the female porcupine forces the male to leave. After about 7 months, a baby porcupine is born. Young porcupines are fully developed at birth and can walk at once. Their quills are soft, leaving them without protection. They nurse for about a month. Then, they are expected to find trees to climb because that is where their food can be found. It takes up to four years for a porcupine to be fully grown. Porcupines can live up to 17 years. Porcupines live in many places depending upon the season. In spring, porcupines will fed on grass in meadows. During summer, they will gnaw on tree roots and new tree shoots. In the winter, their favorite place is in pine trees between 20 to 100 feet above the ground. Porcupines spend most of daylight hours sleeping in dens found in hollow logs or rocky places. They have several dens in their areas. They do not travel too far from their dens. Because of poor eyesight, they always use the same route from the den. Porcupines make paths from their dens to their feeding places. 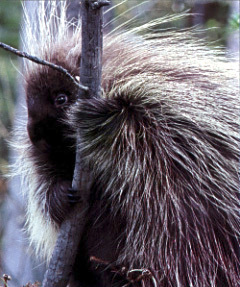 Porcupines love pine needles, pine bark, and the sap from pine trees. (That is how they got their name!) As you have already read, they will eat grasses and tree roots. Porcupines also eat seeds, twigs, berries, and leaves. They are known as herbivores, or plant eaters. Because porcupines love pine bark, they are not popular animals with people in the logging business.